While in New York for the Big Apple Con I had two major highlights. 1) Tour of 30 Rock studios. Scott Adsit who plays Pete Hornberger on the show is a comics fan. We met at Heroes this year and I did a League of Extraordinary Gentlemen piece for him (which I don't have a scan of unfortunately) He, in turn, invited Julia and I to visit the set while they were shooting. We met Tina and Alec, and watched them all film a scene with Scott. Later we sat in on a table read where the entire cast was there. It was great! Thanks Scott! I owe you another LoEG piece! While searching through old sketchbooks, portfolios, and file cabinets I found a bunch of Mouse Guard work from '02/'03. This would have been about one to two years before starting on 'Belly of the Beast', but I think shows a very close connection to the art from that first issue. Saxon, Kenzie, & Abe: In this incarnation Saxon had studded armor but his trademark ear-notch and longsword were there from the start. Kenzie had a long tunic and coat-style cloak. My goal for his longer and more coarse fur is evident near his cheeks. Abagail was 'Abe' at this point. Healers had hoods as a trademark in my mind, but male or female, I knew this character was up to no good. Aubrey, Gwendolyn, & Rand: Aubrey has only been seen in a few panels of the comics so far, but it looks like I borrowed her skirt and belt design for the current incarnation of Gwendolyn's costume. Gwendolyn always had a polearm as a weapon. Rand's shield design started as something based on crusade shields, but has now taken on new meaning I will explore in later series . Celanawe & Midnight: My goal for Celanawe was to show him as an amazing old grizzled mentor who can still hold his own, but has a backstory where he was even more impressive in his prime. I think this may be the first drawings of Celanawe. Midnight was a good character at this point. He had a backstory made up by a pal of mine where he was a former circus performer turned swords-mouse. I kept the name and look, but changed most else about him. At Dragon Con I had my first experience with Mouse Guard costumes aka Cosplay. 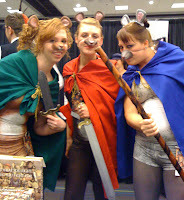 The female trio reminded me of the drawing Nate Pride did for me a while back of a more booth-babe geared Mouse Guard. Thanks ladies for your dedication!! For the next two weeks, I'll be in Ireland and will be unable to type up new blogposts. I plan on using the time to do a bit of research for later Mouse guard stories and to see fans in the UK. So, as I have done in the past, I'll pre-type some posts for Blogger to auto-update for me. The subject matter will be Artists whose work I collect. Wow, those early mouseguard drawings are amazing. Thank you for releasing them. You should experiment more with that style. It's just really engaging. Love the early Mouse Guard stuff there, what decisions made you go with the current look over it? I kept running into Scott at Baltimore. 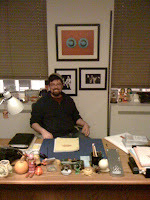 His sketchbooks are amazing! TwiceBorn: Thanks however, I felt that Mouse Guard needed a slightly different look when it came time for the book. I do like some of the 'tunic' designs here, as well as some of the rendering on the rocks..
Mayhem: The big hands and feet didn't feel so 'mouse' like, and the big eyes were had to emote with. When I would try and make that saucer-sized eye be angry or happy, it looked silly. With the smaller eyes I can make small modifications and get that range of emotion. Hey David... I'm just stunned by how awesome these early renditions of the mice are... and of course I'm also completely in love with the latest commissions, as always. Basically, I'm running out of nice things to say, because I have nothing but praise for your work but if I just post awesome! amazing! incredible! every time, I suppose it might start to sound a bit empty? But I really mean it every time when I say how AWESOME this stuff is. Everything you show us, we're very lucky to see here on the blog, and it's all truly fantastic. Thank you, thank you! for continuing to post all your commissions, behind the scenes stuff, early sketches, photos of your models, etc. I love reading your blogs and I love seeing all this stuff. I was wondering if there will be any Winter 1152 t-shirts or mugs coming out soon? The reason i ask was because i was on the Mouse guard site and went to the merchandise section and the stuff that was available is all from Fall. Btw are there any plans for new statues??? Brandon: Thank you. I always appreciate people taking the time to say the enjoy my work and the things I'm posting on the blog. I really want these posts to be entertaining and informative and not just a vain dumping ground for what is on my mind. So thanks for afirming that I'm going in the right direction. Luis: So far, for both figures/statues and t-shirts, there are no immediate plans for new designs. David, regarding my comment on experimenting with the early style, I would never suggest you put them in you "in canon" comics. I would just love to see more indavisual pictures of them. Like an action scene would be awesome. And I would love to see your rendition of an early style weasel. If your too busy or just don't want to, that's fine, but give it some thought. I think I'm speaking for more fans than just me here. We would love to see more in that style. That said, I'm glad you went with waht you did. I think it definately works better in the long run.